I understand there is an annual membership fee of $30 per student, with a family maximum of $65. This is charged at the time of enrollment. Membership Fee is N/A for Creative Steps Dance Company, Adult Fitness classes, Summer Classes & Session/Specialty Classes. I understand my 1st and 10th month tuition for the 2018-2019 session and membership fee (if applicable) will be collected together at time of registration. I understand if enrolling in January start classes 1st and last month tuition is due and will be collected with the membership fee at time of registration. I understand if enrolling after the beginning of a session prior monthly fees are due upon registration. I understand if enrolling in summer session that fees are due upon enrollment. Adult Fitness tuition is collected upon registration. 4-6 week session classes tuition is due in full upon enrollment. I understand any applicable discounts will be applied at the time of receipt by QC Dance, not at the time of online registration. I understand any applicable discounts will be reflected on my account once received by QC Dance. I understand tuition is based on an annual fee. By paying monthly, I agree to pay 10 monthly payments divided equally September - June, with the 1st and 10th month due at enrollment. I understand if enrolling after the beginning of a session prior monthly fees are due upon registration. I understand if enrolling in a January session class I agree to pay 6 monthly payments divided equally January -June, with the 1st and 6th payment due at enrollment. I understand summer class tuition is non-refundable. 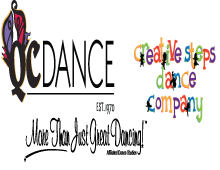 I understand if enrolling in Creative Steps Dance Company Classes or specified QC Dance session classes that the full tuition is due at the time of enrollment and prior to participating in class. I agree that all information completed is accurate, valid and up to date. I agree that I have not falsified any information given. I understand my account information is available to me online and I am able to access this information at my convenience. I understand I am responsible for timely payments. I understand that late fees may apply if not paid by the due date. I understand I am responsible for fees associated with declined and/or expired cards/accounts and insufficient funds ($20.00 fee). I understand a late fee will be applied each month until the account is up to date. I understand annual classes include a recital performance in the spring (typically May/June). I understand these classes include 2 costumes (1 costume for specialty classes, genre specific classes and January Session Classes). I understand costume fees are due in November and January for recreational classes (November only for genre specific classes and January only for specialty classes) and will be deducted through autopayment on the respective months. I understand costume payments for January Session classes are due in February and will be deducted through autopayment. NA for Adult Fitness, Summer Classes and specified Session Classes. I understand costume and tuition fees are non-refundable. I understand that I have the option to waive the preferred payment method of autopayment and provide payment instudio for a one time administrative fee of $50 (due November 1st) for dance classes. NA for adult fitness, Creative Steps Dance Company and specified session classes. I understand fundraising opportunities are available, but optional. Credits are applied to the 10th month, then 9th, etc. Good through current season; may not be used for next season or early registration. No cash value, therefore, no refunds on credits not used as a QC dancer. I understand if I am enrolling in a competition team class or intending placement on a competition team that I will have additional policies to agree to presented to me during audition classes. I understand these policies and procedures will be in addition to these set forth in my online enrollment. There is a 2 month minimum for all annual lessons/classes. N/A for session classes (ex. kettlebells, adult fitness, Creative Steps Dance Company) One month notice from the 7th of the prior month is required to discontinue any lessons/classes and autopayment. Withdrawal must be done in person and will not be accepted over the phone. Withdrawal must be done at the school office and not with the teacher. Withdrawals must occur within the first seven days of the calendar month. No withdrawals will be accepted after March 1. I understand costume payments are non-refundable and upon withdrawal costumes will not be distributed. 2. Complete and sign a withdrawal form provided by the school office. All automatic bank debiting or credit card charges will stop after the one month notice period. QC Dance reserves the right to terminate lesson to any student without notice. I understand the above is required to process a withdrawal request. I understand at withdrawal and unpaid, past due fees, bank or decline charges are due immediately. I understand collective measures may be taken if not paid. If withdrawal from summer class is needed please see the school office for class transfer options. Summer class tuition is non-refundable. Transferring of classes is allowed without a fee within one week of registration. There is a $10 fee per transfer or change made after the one-week grace period. Changes made by QC Dance or recommended by QC will not incur a fee. Waiver & Release. In consideration of the Participant being allowed to participate in the programs and activities of QC Dance and Creative Steps Dance, on behalf of myself and the Participant, we hereby waive, release, indemnify, and discharge the QC and Creative Steps Dance Parties from any and all responsibilities, liabilities, or damages from injuries, death, loss, damage or theft of personal property, or any other damages or liabilities of any kind, arising out of, or connected with participation in QC Dance and Creative Steps activities, use of QC Dance equipment, transportation to and from QC Dance activities, or any negligence by the QC Parties. This release does not apply to intentional, willful or wanton acts. The "QC Parties" means QC Dance and Creative Steps Dance and its owners, officers, directors, employees, contractors, consultants, volunteers, parents, participants, agents, partners, joint ventures, associates, affiliates, representatives, competition sponsors, and everyone else associated with QC Dance programs and activities, and their respective successors and assigns. Theft or Damage to Property. I understand that QC Dance is not responsible for the loss , damage, or theft of personal property such as clothing, shoes, duffel/dance bags, wallets and purses. Assumption of Risk. I understand that dance, conditioning, gymnastics, and participation in the programs of QC Dance and Creative Steps Dance involve the inherent risk of physical injury. Participant and I expressly assume and accept any and all risks of injury or death from participating in QC Dance or Creative Steps Dance activities. In the event I cannot be reached in an emergency, I understand QC Dance or Creative Steps Dance will take necessary emergency action for the health of my child. I understand that if I have provided an Emergency Contact QC Dance is authorized to call this person and they are authorized to pick up my child. I have provided any necessary Special Accommodations included but not limited to any physical, emotional or behavioral issues that QC Dance or Creative Steps Dance should be aware of: Example: my child understands very little English. Example: my child has ADHD. - known allergies and preexisting illness or health concerns. comments whether oral or written and use only my name and city in testimonials. I understand QC Dance and Creative Steps Dance will NOT give or publish my name with my address or phone numbers to anyone. I agree to the Policies and Procedures at QC Dance and Creative Steps Dance and will download a copy or obtain a hard copy in the studio lobby to have for reference throughout the year.